It is hard to believe it’s almost 2018. With the economy booming, many are worried inflation will set in and prices will creep up. Housing prices are on the move upward, and many staple costs like car insurance are trending higher. One reason for this is an increase in auto accidents. For many years, as accident rates trended downward, insurance premiums followed. That reversed about the time smartphones hit the market and took over. People just can’t seem to put their phones down, even while driving. This has caused a surge in automobile accidents that past few year, which has resulted in premiums going higher. In fact, since 2012, the cost of insuring your vehicle has gone up, regardless of how safe of a driver you are. State agencies across the US have initiated safe driving campaigns, with the goal to eliminate distracted driving, especially texting usage behind the wheel. This has coincided with severe penalties for those who get caught texting and driving. These efforts appear to be working a bit, but what about insurance costs going forward? Will 2018 car insurance rates go up or finally go down? Let’s take a look at insurance trends in the upcoming year and tips that can save you hundreds off your ins bill. So you are the safe model driver. You stop completely at stop signs. You yield first to any oncoming driver. You would not dare go over the speed limit and haven’t had a traffic ticket in more than ten years. So you are horrified when you get your new year policy renewal, and there is a 10% or more rate hike. This makes you mad and question all of your safe driver efforts. Well, the truth is other motorists have a big impact on premiums that everyone pays. When vehicular incidents and claims shoot up, carriers across the board increase rates. They do this to simply stay in business and maintain the proper levels of financial viability. Although it might not be fair, that person that caused a three car crash because of texting is causing increased premiums for everyone. In the past five years, the average car insurance policy has shot up about 21.5%! This has far outpaced inflation, which is only around 4% per year. This is the biggest surge in insurance pricing in nearly 25 years. Remember, the insurance industry, despite consolidation in recent years, is fiercely competitive. Insurers know that by raising your rates, there is a good chance you will “jump ship” and go to a competitor. Carriers have been forced to charge more just to break even. 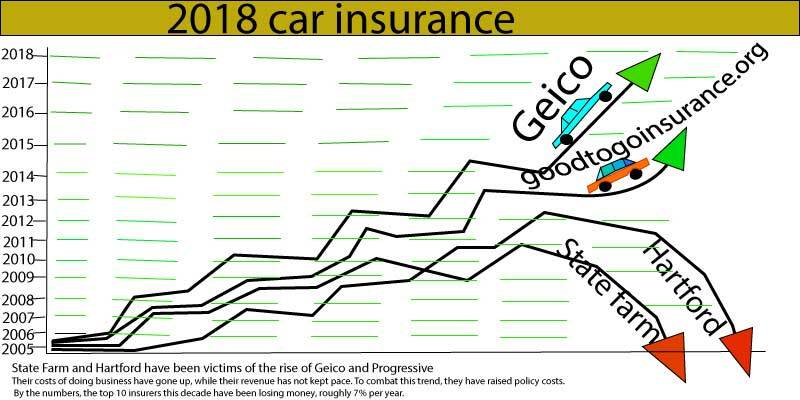 While direct to consumer insurers like Progressive and Geico have seen their business go up in recent years and maintained health profitability, this isn’t the case for many older companies. Their costs of doing business have gone up, while their revenue has not kept pace. To combat this trend, they have raised policy costs. By the numbers, the top 10 insurers this decade have been losing money, roughly 7% per year. The only bright spot for these large carriers is they have taken advantage of a healthy stock market the past few years and made up for those losses through their investments. This is a model though that is not sustainable over the long term. If the stock market takes a big hit, insurers could face losses on their underwriting business and investments. This could spell a disaster. The way out of a financial mess is to raise premiums, which just about every insurer has been doing lately. So as we peek into the future, auto insurance rates in 2018 look to be going up again, about 2% of more, on average. To combat this, there are a few things you can do. One of the best ways to save is to shop online at sites like goodtogoinsurance. You can get quoted in less than 5 minutes and find the best carrier for the policy you want. Get started now and see real online quotes that can save you hundreds.